Light must travel in a straight line and at a constant speed, or so the laws of nature suggest. Now, researchers at the University of the Witwatersrand in Johannesburg have demonstrated that laser light traveling along a helical path through space, can accelerate and decelerate as it spins into the distance. This is the first time that angular acceleration has been observed with light, and is therefore likely to lead to new applications using these structured light fields. The results are contained in a research paper by Professor Andrew Forbes from the Wits School of Physics and his collaborators¹, published online this week in the journal, Physical Review A. Titled: Accelerated rotation with orbital angular momentum modes, the work has also been selected as a highlighted paper by the editors. Forbes, who joined the Wits School of Physics in March this year, is heading up the new Structured Light Laboratory that focuses on creating custom light fields using digital holograms. The research group creates complex light that exhibits interesting physical properties, which they exploit for a range of applications. 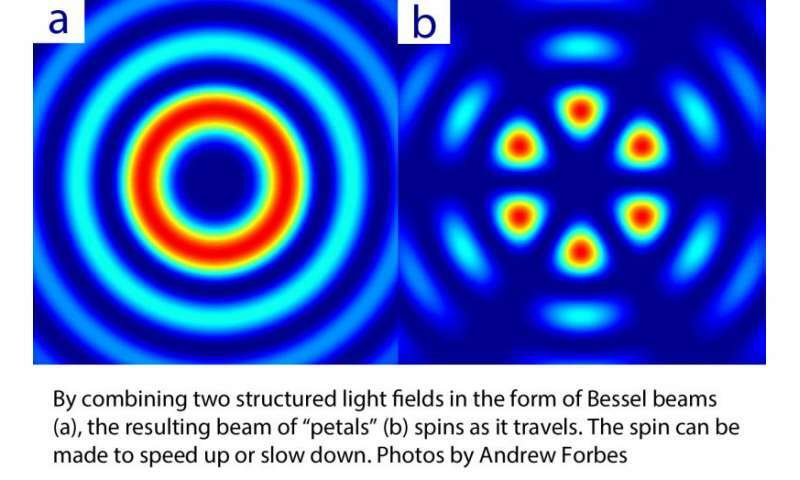 Previously, Forbes and his collaborators have shown that light could be made to spin. In this recent work they demonstrated the first realisation of angular accelerating light and showed that light could also be made to accelerate and decelerate. This acceleration can be controlled with a single parameter that is readily tuned with a digital hologram written to a standard LCD screen, much like your LCD television at home, but just a much smaller version. 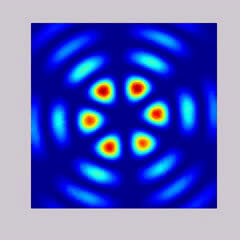 "Our angular accelerating fields rely on combinations of orbital angular momentum - so-called twisted light," says Forbes. Light carrying orbital angular momentum is created by twisting the wave-front of light into a helical shape, forming a spiral. Usually this twist in the light's wave-front is smooth, like a spiral staircase with regular steps. "Our novelty was to realise that by twisting the helicity of these beams in a non-linear fashion, the result would be a propagation dependent angular velocity," he explains. In other words, the light spins at a non-constant speed, resulting in angular acceleration. In fact, the light speeds up and slows down as it travels, periodically switching from one mode to the other. Following its helical path through space, the helix appears to wind up very tightly as it accelerates, and winds down very loosely as it decelerates. It is intriguing that by "twisting the twist", nature provides an additional momentum to the field causing it to accelerate as it spins. The team expects this new optical field to be of interest as a tool to study some fundamental physical processes with light, as well as a tool in optically driving micro-fluidic flow. What is the difference between this "spin" and circular polarization? It sure sounds like they're discussing the same thing. I cant claim to understand it all but I dont think circular polarization would be described as helical. My question would be whether acceleration is caused by a changing index of refraction and/or changing birefringence. Light does move slower when going through a high index, so if you were able to reduce index it would appear to accelerate. It is interesting to note that nowadays we still do not understand why & how such the laws of nature work! Now, researchers at the University of the Witwatersrand in Johannesburg have demonstrated that laser light traveling along a helical path through space, can accelerate and decelerate as it spins into the distance. We still do not understand why & how such the laws of nature work? We know a lot about how the laws of nature work and still have much more to learn. It's the reason you have a computer, smart phone, the internet, GPS, modern medicine and so on. I cant claim to understand it all but I dont think circular polarization would be described as helical.